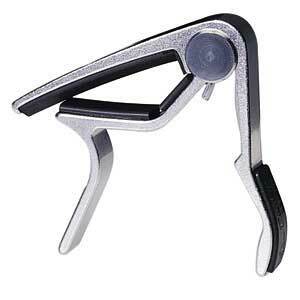 The Shubb C1 Original Guitar Capo is a top of the line capo that clamps tightly to your guitar. 2 inches wide and slightly curved, the strap fits most steel-string acoustic and electric guitars. Since 1980 the Shubb capo has set the standard against which all others must be measured. It is the first choice ... often the only choice... of more than a million musicians worldwide. Once serious guitarists have discovered the Shubb, they'll never settle for anything less! 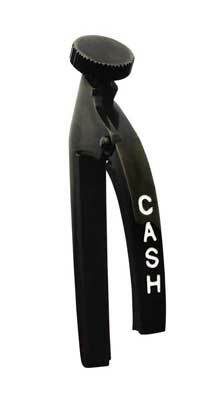 The Dunlop Johnny Cash Capo was inspired by Cash's trusty Victor Capo. This Capo in Black is rugged and durable, with a solid, cast-bronze construction for increased mass and sustain. Its precise wormgear adjustment provides even pressure across your strings for excellent tuning stability and easy repositioning. The Man in Black. In a career that spanned almost five decades, Johnny Cash gave us more than 100 records and dozens of hit singles. And he did it all with the simple, powerful honesty that would become his trademark. The Cash Capo - Tough: Honest. Classic. Your sound shouldn't change when you put on a capo. With Dunlop, you'll come through loud, clear and in tune. The trigger capo features a curved shape that fits almost any acoustic or electric guitar. 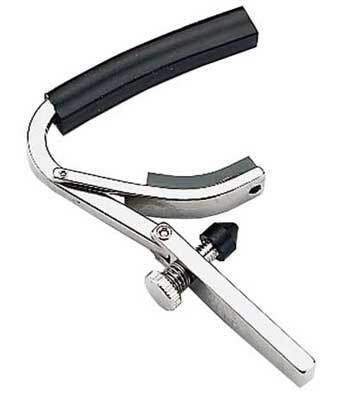 The Dunlop Trigger Capo is made of aircraft quality aluminum.